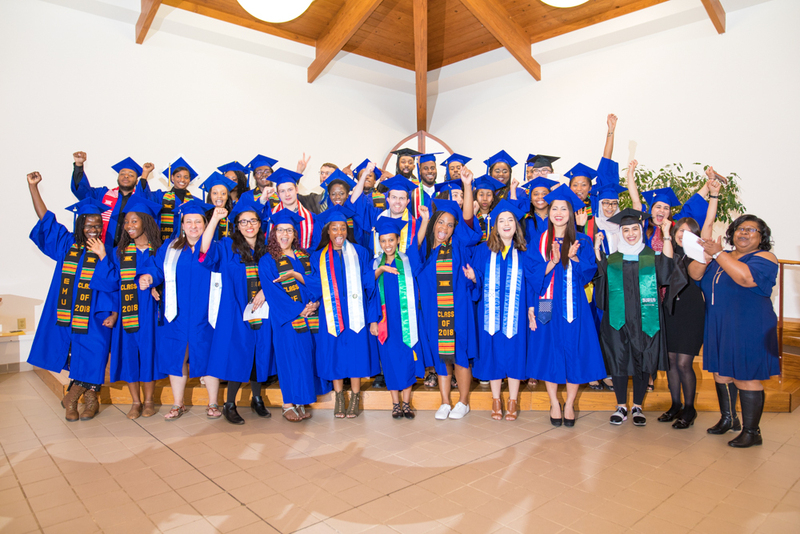 “The question is, what have you learned, and what traditions has Eastern Mennonite University imprinted on you?” asked Professor David Owusu-Ansah of soon-to-be-graduates at Eastern Mennonite University’s third annual Donning of the Kente ceremony in Martin Chapel. “Do you know what an EMU graduate should do and be when you are no longer on campus? Think of these things, of the people who invested in you because they believed in you. … Be a very good ambassador,” he urged. 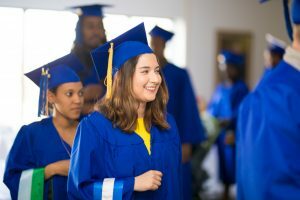 Though many of students present perhaps thought beyond impending finals to consider their future plans, the ceremony was the first time to put on their caps and gowns and the first inkling of the celebration to come. 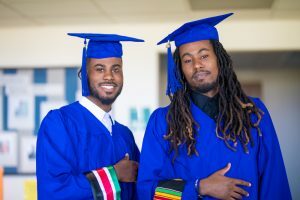 During the May 6 Commencement ceremony, each of the 33 will wear a special stole, some made of kente cloth but others of satin fabric symbolizing heritage, roots within one or various communities, or citizenship. 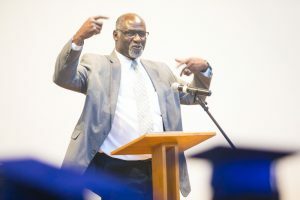 Professor David Owusu-Ansah, professor of history at James Madison University, encouraged graduates to think and act as ambassadors of their alma mater. He teaches an African history course every two years at EMU. The formal presentation of these stoles was the reason for coming together with family, friends and EMU community members Wednesday evening. The ceremony celebrates the accomplishments of graduating students of color as well as the history of black students’ and students of color achievements at the university, according to Multicultural Student Services Director Celeste Thomas, who started the first event three years ago. See this event and more in EMU’s Centennial timeline chronicling diversity on campus. Micah Shristi, co-director of international student services and advisor to the International Student Organization, and M. Esther Showalter, advisor to the Latino Student Alliance, also co-hosted the event. Read 2017 and 2016 coverage of the event. Eyman Alasbali is graduating with an MA in education. Her father Ghorm Alasbali and mother Abdiah Alshebri presented the stole. She plans to take additional classes for a second concentration and then return to help her community. Genesis Arzu is earning a degree in digital media and plans to work in a production studio as an audio engineer after graduation. Celeste Thomas presented her stole. Natasha Bridge is earning a degree in kinesiology and exercise science. Carolyn Stauffer, professor of sociology, presented her with the stole. Natasha plans to move home and work and further her education within the next two years. Jazmine Carter is earning a degree in business administration, and plans to attend graduate school in the spring. Andrew Miller, instructor of business, awarded her stole. Kevin A. Clark is earning a degree in Spanish with a minor in digital communications. Ann Hershberger, professor of nursing, presented his stole. Phoebe Coffie is earning a degree in biology. After graduation, she plans to take the MCAT and continue shadowing and volunteering, working towards medical school entrance. Micah Shristi presented her stole. Fabiana Espinal is followed by Denait Gebretsadik during the processional. Kimberly Daley is graduating with a degree in nursing. Marcia Pusey, instructor of nursing, presented her stole. Her goal is to be debt-free within three years. Drew Diaz is earning a degree in biology and hopes to go to medical school His mother Pam Diaz awarded the stole. Fabiana Espinal has earned a degree in liberal arts with a concentration in psychology. Amanda Styer and Alex Bowdey presented the stole. She plans to continue to be involved in the community following an internship related to Title IX and restorative justice. She’ll begin graduate school in fall 2019. Denait Gebretsadik is graduating with a degree in history and a minor in Spanish. She was gifted her stole by Asmait Asgedom, and it was presented by Mark Sawin, professor of history. Brothers Maleke and Jerome Jones will each graduate with a degree in psychology. Jerome Jones will graduate with a degree in psychology and plans to pursue a master’s degree in clinical psychology. Melody Pannell, professor of sociology, presented his stole. Maleke Jones is graduating with a degree in psychology and a minor in pre-law. He will work for a local police department. Melody Pannell presented his stole. Emmanuel Kampanga earned a degree in biology. He plans to take the MCAT and apply for medical schools in Europe. Micah Shristi presented his stole. Keyri Lopez-Godoy is graduating with a degree in liberal arts and a PK-6 elementary education endorsement. She will teach in Harrisonburg City Schools. Mentor Louise Gallagher presented the stole. Luisa Angel Mallard is earning a degree in communication. She hopes to eventually earn a master’s degree in restorative justice. Micah Shristi presented her stole. Lania McKoy will graduate with a nursing degree and a psychology minor. Lamarr Wharwood presented her with the stole. She plans to celebrate this accomplishment, study for the nursing boards and then be the best nurse she can be. Kennedy Okerere, a brother of Kappa Alpha Psi fraternity, is congratulated by Celeste Thomas, director of multicultural student services. Mandy Miller is earning a degree in social work. She wants to work for two years and then return for a master’s degree. Celeste Thomas awarded her stole. Kennedy Okerere is earning a degree in business administration. He will return to his home state of Maryland to begin a new job. Celeste Thomas awarded his stole. Louisa Quaynor will graduate with a degree in nursing. She plans to work in a Richmond area hospital after graduation. Marcia Pusey, instructor of nursing, awarded her stole. Alejandra Tejada Rivera is earning a degree in nursing. She plans to work at Sentara RMH in the orthopedic unit. David Diaz presented her stole. Da’Jahnea Robinson is earning a degree in psychology. Charisse Robinson presented her with the stole. Da’Jahnea will continue her studies in the MA in Counseling program at EMU. 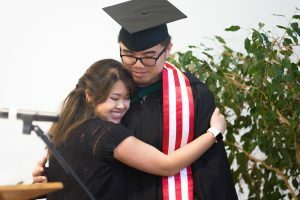 Chang Tan receives congratulations from close friend and fellow MA in biomedicine graduate student Thi Do Lovo after she placed the stole around his neck. Chang Tan will graduate with an MA in biomedicine. He will work as a research coordinator while preparing medical school applications. Fellow graduate student Thi Do Lovo presented his stole. Delight Tigoe has earned a degree in accounting. Her stole was presented by Lana Miller, undergraduate campus pastor, and Andrew Miller, instructor of business. Myneshia Walker is graduating with a degree in sociology and a minor in coaching. She plans to return to her hometown and begin working. Sandy Brownscombe, professor of physical education, presented her stole. Adila Wahdat graduates with a degree in digital media. She will work in marketing for a jewelry company. Friend Asmait Asgedom gifted her stole and was also the presenter. Aminata Wallet-Mohamed will graduate with a degree in sociology. Friend Asmait Asgedom gifted her stole and was also the presenter. Alexa Weeks is earning a degree in liberal arts with licensure in elementary education. Lana Miller, undergraduate campus pastor, presented her stole. Alexa hopes to find a teaching job in the Harrisonburg area after graduation. 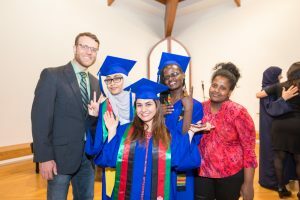 From left: Micah Shristi, director of international student services, with Aminata Wallet-Mohamed, Adila Wahdat, Luisa Mallard, and Asmait Asgedom, who gifted and presented several stoles to friends. Brittany Williams is earning a degree in recreation, leadership and sport studies. She plans to stay in Harrisonburg and work. Celeste Thomas presented her stole. Isaiah Harris-Winn is earning a degree in business administration. Carolyn Stauffer, professor of sociology, presented his stole. He hopes to continue his basketball career overseas. Elizabeth Witmer is earning a degree in social work with minors in sociology and Spanish. Ann Hershberger, professor of nursing, presented her stole. She will complete her social work practicum this summer in Guatemala and then continue working as office coordinator in the Intensive English Program. Ryan Yates is earning an MA in interdisciplinary studies and a graduate certificate in transformative leadership. 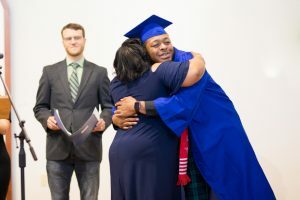 He plans to move to Los Angeles, California, and “create opportunities that will live on well beyond my years.” Deanna Durham, professor of social work, and Celeste Thomas presented him with his stole. Brianna Zook is earning a degree in kinesiology and exercise science with minors in business and coaching. Kevin Griffin, head women’s basketball coach, presented her with the stole. She plans to attend graduate school.